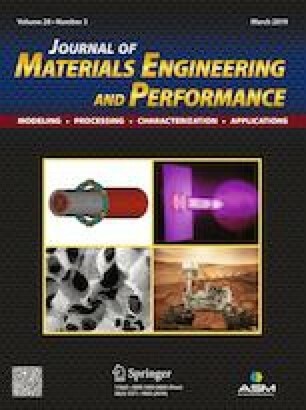 This study analyzes the effects of replacing Ta by Nb (at.% basis) in the phase transformation temperatures, Scheil solidification behavior, and microstructural mechanical features of a Nb-modified as well as conventional Mar-M247 superalloys. Both alloys were directionally solidified at a withdrawal rate of 18 cm/h under a thermal gradient of about 80 °C/cm. DSC results were compared to thermodynamic simulations of phase transformation temperatures and showed a good correlation. The replacement of Ta by Nb has not altered the solidification path of Mar-M247, keeping the sequence L → L + γ → L + γ + MC → L + γ + MC + γ/γ′ eutectic. Due to the segregation of Hf and Zr to the very last liquid to solidify, a low melting point γ/Ni5(Hf,Zr) constituent was observed. The as-solidified microstructures of both Mar-M247(Nb) and Mar-M247 were constituted of columnar dendrites of gamma matrix (γ) phase with cuboidal gamma-prime (γ′) precipitates. In addition, γ/γ′-eutectic was observed in the interdendritic region along with MC carbides in blocky, script (blocky dendritic), needle-like and fine nodular morphologies. Both alloys contained about 1.5 vol.% of MC carbides. The MC carbides in Mar-M247(Nb) and Mar-M247 are, respectively, Nb-rich and Ta-rich, with only a limited amount of Hf being detected in the MC phase. The yield stress of Nb-modified Mar-M247 showed higher values up to 750 °C. For higher temperatures, above 800 °C, a conventional Mar-M247 presented a higher value of yield stress. The authors acknowledge CAPES (Brasília, Brazil) for funding and supporting this project (Program RIPS/Pró-Engenharias). S. Milenkovic, I. Sabirov, and J. Llorca, Effect of the Cooling Rate on Microstructure and Hardness of MAR-M247 Ni-Based Superalloy, Mater. Lett., Elsevier B.V., 2012, 73, p 216–219, https://doi.org/10.1016/j.matlet.2012.01.028. Z.H. Yu, L. Liu, X.B. Zhao, W.G. Zhang, J. Zhang, and H.Z. Fu, Effect of Solidification Rate on MC-Type Carbide Morphology in Single Crystal Ni-Base Superalloy AM3, Trans. Nonferrous Met. Soc. China (English Ed., The Nonferrous Metals Society of China, 2010, 20(10), p 1835–1840, https://doi.org/10.1016/s1003-6326(09)60382-4. B. Gan and S. Tin, Assessment of the Effectiveness of Transition Metal Solutes in Hardening of Ni Solid Solutions, Mater. Sci. Eng. A, Elsevier B.V., 2010, 527(26), p 6809–6815, https://doi.org/10.1016/j.msea.2010.06.071.